Currently, stormwater runoff from the South Broad Street area and adjacent neighborhoods is routed by pipe to Meadow Park and discharged to Meadow Creek. From Meadow Creek, the water travels mostly by culvert to San Luis Obispo Creek. High stormwater runoff volumes, rates and pollutants are negatively impacting both of these creeks. The green infrastructure opportunity makes use of the park space to integrate a subsurface capture and use system. The design includes the excavation and installation of a StormTrap system and shows how stormwater runoff can be routed to the system to be stored and/or reused. 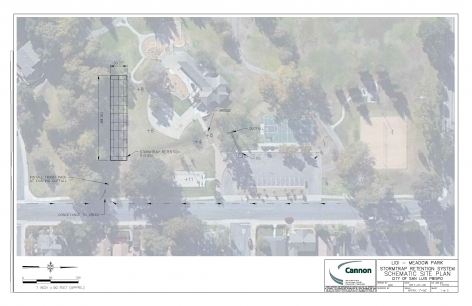 Additionally, the design includes an irrigation component so that captured stormwater can be used to irrigate the park. This design provides stormwater runoff management, creek protection and ancillary benefits (i.e. irrigation) with limited available space.